The fauna of Australia shows many differences from that of the adjacent Indo-Malaysian region. Obviously the continent was isolated for millennia, and the few animals that reached it were able to specialize with little competition. One such group were the pygopods (stump feet) or scaly feet of which this lizard is the one example. Closely related to the geckos, the pygopods have become elongate (some up to 2 feet in length) and gradually reduced their limbs. Some show short stumps while others are completely limbless; this blackheaded form has lost the front limbs, but retained well developed hindlimbs. The general tendency toward loss of limbs occurred separately in a number of other groups of lizards as well. Apparently elongation made it easier for some such animals to pass through narrow crevices, such as those in grass tussocks, by crawling. Crawling also costs much less energy than walking on limbs. 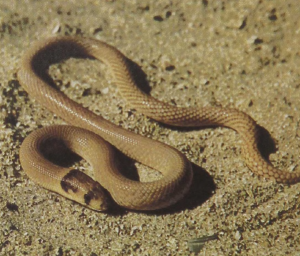 The slowly moving Black-headed Scaly Foot is a predator of arthropods. It is the largest pygopod found in the interior deserts of Australia.